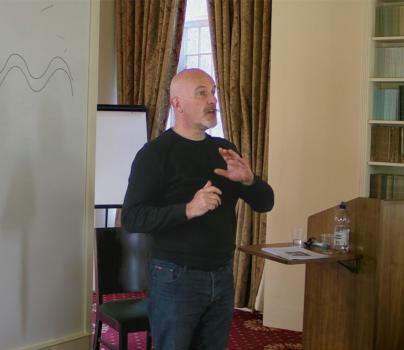 Richard Blacklaw-Jones lectured at Lampeter on 21 April 2015 on the topic of the electromagnetic nature of the therapeutic encounter. He began with the physical cosmos, within which fields, extending out to infinity, set the scene of our life, and, within it, osteopathy. In the 1870s medicine of any nature recognised today was rare. Andrew Still, the originator of osteopathy (then named Fingerless Surgery), was as qualified as anyone at that time. Rivalry arose between traditional medicine, as it developed towards modern medicine, and osteopathy. Eventually came the Osteopaths Act 1993, but research into osteopathy remained very restricted. There is not enough money to do the necessary research, which explains why it does not yet have the validations it would wish, and certainly deserves. Cranial Osteopathy, the result of the investigations of William Sutherland, is, as yet, even less well-grounded in research. Nonetheless, osteopathy has gained great popularity, but the equipment necessary for research of the electromagnetic processes it is now suggested are involved is so expensive that little progress can be made to verify the claims without huge public funding, which is still refused. Turning again to the cosmological context of all electromagnetic effects, Richard spoke of the Schumann Resonance. Whilst the resonance was known, its relevance to osteopathic treatment had not been suggested until Richard Blacklaw-Jones himself wrote to the International Journal of Osteopathy, who invited him to author a fully-referenced and refereed paper stating the hypothesis. It was none other than James Oschman who, as the academic referee, validated Richard’s paper. It is now acknowledged that an electromagnetic explanation of the whole of the chain of cause and effect, from cosmos to osteopathic practitioner to patient’s body, is indeed theoretically correct. Richard went on to explain the generation of electromagnetic fields (there are more sheep than physicists among the hills of West Wales, though I saw no sheep in Richard’s audience, who all listened attentively), and he assured us that, so far, nothing in his talk was controversial. Our technological society now uses electromagnetic sensing-at-a-distance, field-sensing, in everyday practice, whether with medicine’s SQUID machines or with the dowser’s bent coathangers. Richard’s next step was to mention the liquid-crystal structure of collagen, present throughout the body, and therefore highly relevant to all treatments, including osteopathy. Homoeopathy was hinted at, but not specifically mentioned (Richard had to accommodate his lecture within the time restraints common to such occasions), when he referred to the bond angles of water, then went quickly on to deal with the main Schumann Resonance, an 8 Herz frequency common to both the electromagnetic atmosphere within which we live our terrestrial life, and the fields generated by a healer’s hands. Here, within its proper context of established physics, was the central message of Richard’s talk. Therapists, and others, produce this same frequency as radiation from their hands, and do so close enough to the patient’s body to have a strong effect. The meditator’s alpha rhythm of alert but unforced and unfocused attentiveness is also about 8 Herz. This frequency within the body correlates with better health. The healing takes place because the healer’s radiant frequency entrains the less healthy frequencies within the patient’s body. There were two question sessions. Asked by Dr Maureen Lockhart how close Richard thought cranial osteopathy is to spiritual healing he replied “probably a lot closer than it would like to think”. The great question which must then follow, and will indeed follow once the electromagnetic effects of touch are acknowledged, concerns the relationship of the physical world to the inferrable, but little-experienced, spiritual cosmos. Tibor Putnoki’s experience of somatic death as vibrant disembodied life (see below, in this West Walian part of the SMN website) is highly relevant to this question. Will that world prove to be separate from our world, or a finer extension of it? That argument has exercised minds for millennia, without, as yet, convincing materialists that there is indeed a higher world which is usually concealed from most inhabitants of this world. Who will come to Lampeter and lecture on this further theme? Meanwhile, Richard Blacklaw-Jones himself will be glad to lecture elsewhere on his present topic of electromagnetism in hands-on healing. He can be contacted direct at Richard Blacklaw-Jones <[email protected]>.